After Davidson’s death, Probasco and his wife traveled throughout Europe, where he visited several foundries to view designs for fountains. The partners had often discussed a public fountain in Cincinnati, and in memory of his friend and brother-in-law, Probasco decided to bequeath a fountain to the city in his honor. This fountain, known as the Tyler Davidson Fountain, is the better known of the two fountains gifted by Probasco to the city of Cincinnati. Also known as “The Genius of Water”, the fountain is located in Fountain Square in downtown Cincinnati, and has been a symbol of the city since its installation October 6, 1871, on a small island esplanade in the center of Fifth Street between Vine and Walnut Streets. The second fountain is located in Clifton, at the intersection of Clifton Avenue and Woolper Avenue, and is known as the Probasco Fountain. This fountain was a gift to the community of Clifton, where Probasco lived with his wife Julia on a large estate known as “Oakwood.” The house, built between 1859-1866, is located on Cliff Avenue just off Lafayette Avenue. 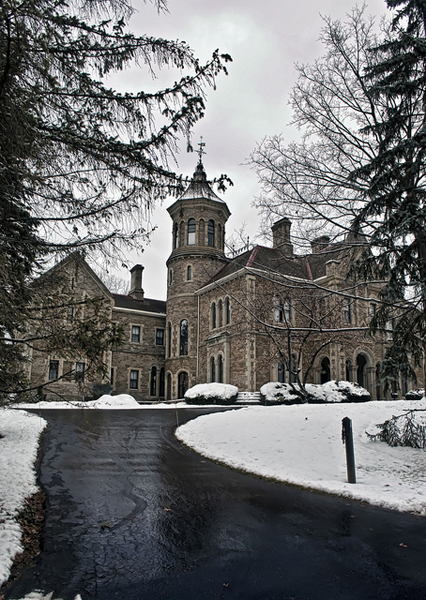 Designed by architect William Tinsley in the Norman Romanesque Revival style, it was the first residential structure in the area to be built using a combination of limestone and sandstone. Large homes made with this combination of materials can still be found in many areas of Cincinnati. Both fountains are comprised of smaller drinking fountains for pedestrians to refresh themselves, as well as multiple basins from which birds, horses and pets would drink. 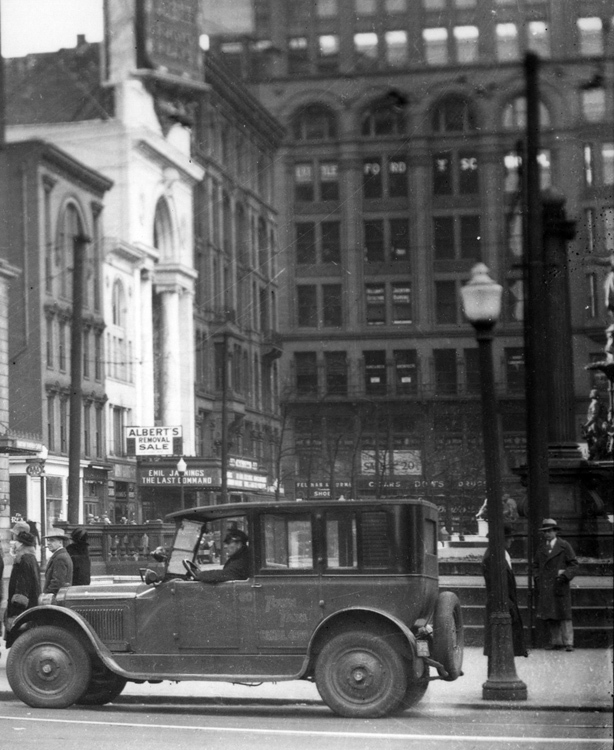 Standing 43 feet tall and constructed of bronze and granite, the fountain was originally situated where the Fifth Street Market stood, between Vine Street and Walnut Street. The fountain and the square have been reoriented for better traffic flow since the original dedication, but Fountain Square remains a central hub of cultural events in Cincinnati. Thanks to the generous gift of Henry Probasco, a grand esplanade with a central fountain offering a cool drink to horses, dogs, cats, birds and humans alike instead graced that section of Fifth Street, welcoming a “higher class” of citizenry to the area. Photographs of the square are available in the City Engineer’s collection, but are post 1920, with one being from the back and the other being partially cut-off, (the street condition, and not the fountain, being the central focus of the image). However, this provides a good representation of how the Fifth Street esplanade was situated, prior to its current orientation. The Nelson and Florence Hoffmann Cincinnati Postcard Collection, located at the University of Cincinnati’s Archives & Rare Books Library, includes postcards depicting Fountain Square and the Tyler Davidson Fountain between 1904 and 1964, as well as a postcard of the Probasco Fountain on Clifton Avenue. The proposed 1914 Edwards-Baldwin Loop of the subway route called for a main station to be located downtown beneath the site of the original Fountain Square esplanade, at Walnut and Fifth Streets. The Walnut Street branch was not completed, but capped off at the “Walnut Street Y” further up Walnut Street closer to Central Parkway. Further north, the surface subway station originally planned for Northside was moved to Clifton, and so Clifton Avenue, near the Probasco mansion, was altered to accommodate the station. Today, the tunnel at the Walnut Street turn remains, but the Clifton Avenue surface station has been dismantled. Images in the collection prove once again to be an integral part of the history and culture of Cincinnati. Recently, it has been proposed that the Probasco Fountain on Clifton Avenue should be moved several feet back from its current location for safety reasons. Listed on the National Register in 1980 and part of the Clifton Avenue Historical District, the fountain has remained in its original location since it was dedicated to the neighborhood in 1887. Since then, cars, delivery trucks and other automobiles have replaced the horses passing close by this fountain, and there is great concern for its safety. Proposals and budget estimates for the move have been submitted to the city of Cincinnati, requesting the fountain be restored and moved to a safer location. Because of its association with Probasco and the Tyler Davidson Fountain, and the fact this fountain was designed by Samuel Hannaford, the architect for Cincinnati’s famed Music Hall, the city is sure to foot the bill for the suggested placement = 7½ feet west and 2 feet north of its current, and original, location. While preservation purists would argue the fountain should remain where it was installed, those with a fondness for the fountain wish to ensure it remains intact and continues to provide a cool drink of water for all to enjoy. History of Cincinnati and Hamilton County, Ohio Their Past and Present. S. B. Nelson & Co., Publishers, Cincinnati, OH 1894. Box 1, Folder 42, p. 1, Nelson and Florence Hoffman Cincinnati Postcard Collection, 1788-2010, US-12-03, Archives and Rare Books Library, University of Cincinnati, Cincinnati, Ohio.